To mark the return of the school year, we dedicated this edition of the newsletter to education and the environment! Learn about two schools that are doing their part to create a cleaner future for Canada, and check out resources for teaching kids about clean energy and environmental action—both inside and outside of the classroom. 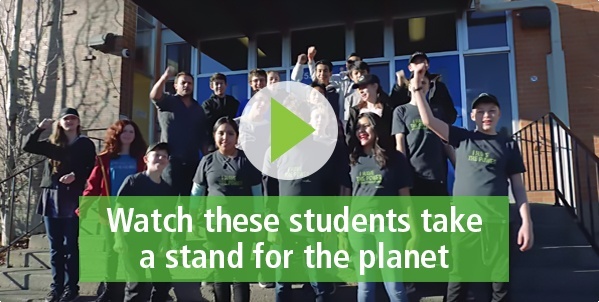 Check out this new video featuring bullfropowered Senator Patrick Burns School in Calgary! At Senator Patrick Burns, the students actually pay for the green energy—through an innovative recycling program they started. Want to learn more about bullfrogpowering your own school? Contact us. Teach kids about energy with our learning resources! We've created some special resources to help teach children and students about how they can make the planet a cleaner place to live! Download our children's book, Gemma Learns About Energy, as well as our Bullfrog Power activity sheet for kids. Teachers: recycle your ink and toner with Staples Canada! Looking for ways to reduce the footprint of your classroom? Staples Canada is offering a free ink and toner recycling program to help schools cut down on printing waste. Staples is also partnering with TerraCycle to collect and recycle writing instruments in classrooms—learn how you can take part. Congrats to BCEC and Kew Beach Public School on two years! The Beach Community Energy Cooperative recently celebrated the two-year anniversary of the 72 kW solar array on Kew Beach Public School in Toronto. You—the bullfrogpowered community—helped support the launch of the project. A portion of the funds from the generated energy is used to support eco-activities within the school and community. Take a peek at the project's live data on the BCEC website.